On 25th January 2017, Dr Cheryl Lawther and Dr Lauren Dempster participated in a walking tour of the Ballymurphy area of west Belfast with a tour guide from the former political prisoners’ organisation, Coiste na n-larchimí. As another geographically-focused tour, this walking tour provided the team with a rich account of the manifestation of the conflict in this urban area, as told by a long-term local resident. 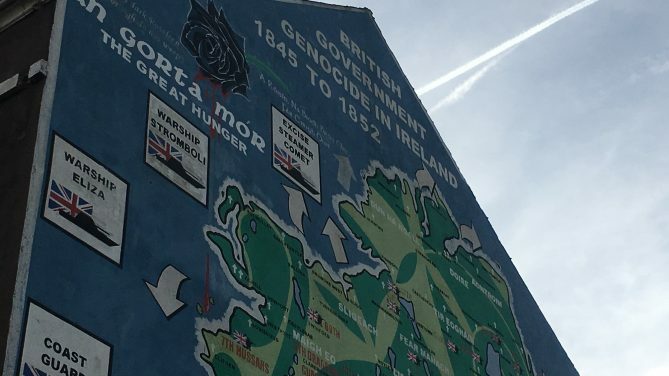 The close-knit nature of the community was highlighted, and a visit to a Republican memorial and a number of murals emphasised the historical and continuing importance of Irish Republicanism within this area.